Vicky Kaspi will have to divert her gaze from the heavens long enough to shake some hands and collect some more hardware. 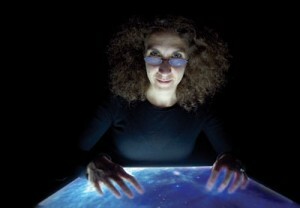 McGill’s Lorne Trottier Chair in Astrophysics and Cosmology and Canada Research Chair in Observational Astrophysics has been awarded a 2009 Prix du Québec, the highest honour conferred by the provincial government, in recognition of her contribution to the social and scientific advancement of Quebec. Kaspi will receive her Prix Marie-Victorin for natural science and engineering on Nov. 3 at a ceremony at the National Assembly in Quebec City. Kaspi is a world-renowned physicist known for her cutting-edge work on neutron stars, pulsars and supernovae remnants. In 2005, Kaspi and her team discovered the fastest-rotating pulsar known to science and more than 20 pulsars in a single star cluster in the Milky Way. Most recently, her team was the first to witness a cosmic act of recycling involving a dying pulsar. The Prix Marie-Victorin is only the latest of Kaspi’s many awards. She has been honoured with the Steacie Prize in the Natural Sciences, the Rutherford Memorial Medal of the Royal Society of Canada, the Canadian Association of Physicists Herzberg Medal, and the Canadian Institute for Advanced Research Young Explorer Prize. The Prix du Québec are presented annually to distinguished researchers for their outstanding contributions to their field or in honour of a career devoted to research management and development or promotion of science and technology. Winners receive $30,000 and a silver medal created by a Quebec artist. Kaspi joins a long list of illustrious McGill researchers like Graham Bell (2004) and Lawrence Mysak (2006), to name only the two most recent recipients of the Prix Marie-Victorin, to have been awarded the Prix du Québec.